DRtL Episode 46: Horror Double Features! If you’re starting to plan your Halloween party — and if you’re not, you’d better get on that, you only have 104 days left — we have totally got you covered this episode. Want to show your friends a couple of movies? This episode we talk about Horror Double Features and give our picks for what movies pair together well, like pairing cheeses and fine wines. While we’re at it, we talk about just what exactly makes two movies go together well as a single viewing. We discuss the endings of both 10 Cloverfield Lane and Ex Machina. If you don’t want to hear the details, skip forward a couple of minutes when you hear us mention those titles. We mention at the beginning of this episode that we were recording it on our laptop and on our new audio recorder, because Montoure didn’t trust that the recording was actually, you know, recording. And it’s a damn good thing he’s paranoid, because it turns out that the recorder did not save a file at all. The quality the first time we used it was great, and it will be a fine tool to add to our podcasting arsenal if we can ever figure out how to use the damn thing. 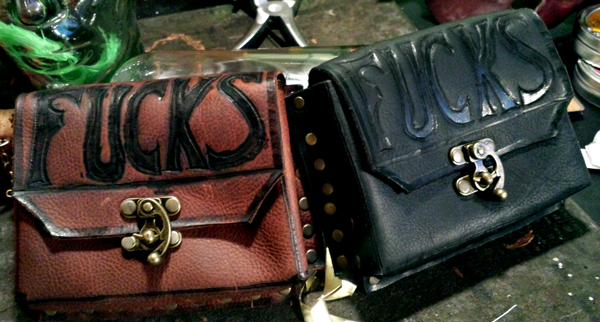 We mention in passing The Bag of Fucks, which is an awesome hand-made creation by our friend Dmitri Arbacauskas at Tormented Artifacts. When you have just run out of fucks to give, here’s the bag you could load some more into. (Or you can just open the bag if you want to show people that it is, indeed, empty.) You can get one of these beauties here if you are so inclined. Since we brought up Chopping Mall, a movie about security robots gone rogue in a shopping center, we naturally talked about a related story in the news recently, and in case you missed it, here it is: A mall security robot has knocked down and run over a toddler in Silicon Valley. If you like the show, don’t forgot to follow us and rate us on iTunes! You can also subscribe to the podcast on Stitcher, and you can follow us on Facebook, Twitter, and Tumblr. Remember that we love you and that we think you look adorable when you’re sleeping.